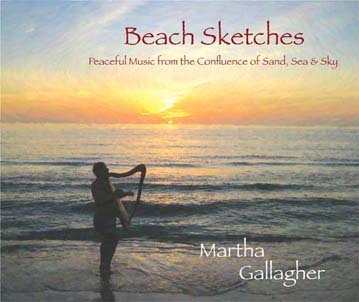 Beach Sketches is Martha's newest release of all original music. Humans have long revered water as sacred; water blesses; cleanses heals. The myriad ways that walking is beneficial are well documented. Humans have been looking to the heavens since time out of mind; seeking answers to the great Mysteries of Life, solutions to the small puzzles of their own lives, and simply gazing in awe at the magnificence of the cosmos. In your heart and soul you know all this. Perhaps you have even experienced that enigmatic transformation that can happen to a person when walking the beach, pondering sand, sea, and sky. Born of moving water, dancing light, air in motion, sunrises, sunsets, birds, dolphins, shells, stars, planets, vast mysteries, these music creations invite you to reflect and reveal, contemplate and celebrate daily moments of wonder and metamorphoses. Recorded at Lane Gibson Recording & Mastering.